3544b, CENTER CAP USED, 04-06 FORD, FREESTAR, SPARKLE SILVER, BLUE FORD LOGO IN CENTER, 5 PLASTIC CLIPS & WIRE RING, 6-1/2" DIA. 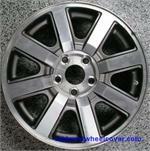 3544b, Used Rims, 16X6-1/2 5 LUG 4-1/4" 04-06 FORD FREESTAR SPARKLE SILVER. 5 OPEN SPOKES. ALUMINUM, PAINTED. TPMS. 3657, Used Rims, 18X8-1/2, 6 LUG, 135mm, 07-11, FORD, EXPEDITION, MACHINED FACE, PAINTED SILVER POCKETS, 6 OPEN SPOKES, TPMS, ALLOY. 3672, Used Rims, 17X7-1/2, 5 LUG, 4-1/2", 07-10, FORD, EDGE, 5 SPLIT SPOKES, WITH TPMS, PAINTED SILVER, ALLOY. 3690b, REAR CENTER CAP USED, 08-09, FORD, F-250 SD, F-350 SD, SRW, TPMS, CHROME PLASTIC CAP, BLUE FORD OVAL, CHROME WORD FORD, 8-5/8" DIA. 3690b, REAR CENTER CAP USED, 08-09, FORD, F-250 SD, F-350 SD, SRW, TPMS, CHROME PLASTIC CAP, BLUE FORD OVAL WITH CHROME RING AND CHROME WORD FORD, 8 PLASTIC CLIPS, 8-5/8" DIA.. FOR A 18" RIM, ALSO FITS 3688, 3689, REARS. 3695, Used Rims, 18X7-1/2, 5 LUG, 4-1/2", '08-'09, FORD, TAURUS, TAURUS X, 7 SPOKE, DOUBLE INDENTS IN SPOKES, CHROME CLADDING, WITH TPMS, ALLOY. 3695, Used Rims, 18X7-1/2, 5 LUG, 4-1/2", 08-09, FORD, TAURUS, TAURUS X, 7 SPOKE WITH DOUBLE INDENTS IN SPOKES, CHROME CLADDING, WITH TPMS, ALLOY. 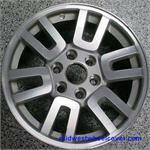 63884b, Used Rims, 16X7, 5 LUG, 120MM, 07-08, HONDA, ODYSSEY, WITH TPMS, STEEL. 63899c, Used Rims, 16X6-1/2, 5 LUG, 115 MM, W/TPMS, 08-10, HONDA, CIVIC, 5 SPOKE, ALLOY. A & B FIT DIFFERENCE IS TPMS..
64913, Used Rims, 17X6-1/2, 5 LUG, 114mm, 08-10, MAZDA, 5, 5 SPOKE, OPEN ENDS, TPMS, ALLOY. 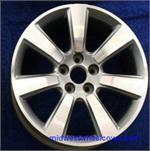 70727b, Used Rims, 17X6-1/2, 5 LUG, 4-1/2", 06-08, HYUNDAI, Sonata, ALLOY, SPARKLE SILVER, 5 SPOKE, WITH TPMS A= W/O TPMS B=WITH TPMS. 74615, Used Rims, 15X6, 5 LUG, 115mm, 10-12, KIA, SOUL, 15 HOLE, STD. STEEL W/TPMS.